Notre Dame receiver Chase Claypool has impressed all spring and had his best day on Saturday. Offensive coordinator Chip Long said Claypool has needed to focus more, but the 6-foot-5, 229-pounder believes he just needed sleep. A heavy academic load isn’t unheard of at Notre Dame, but Claypool’s schedule is extremely full this semester as he hopes his hard work will pay off next fall. The lighter class load may help next fall, but Claypool is getting tested each day in practice by classmate Troy Pride Jr. Pride figures to be one of the nation’s top cornerbacks in 2019 and the two have embraced competing each practice this spring. Claypool admits there has always been some trash talking involved with Pride and the other defensive backs, but it’s a healthy edge and has allowed everyone to raise their game. In 2018, Claypool had a breakout season with 50 catches for 639 yards and four touchdowns. 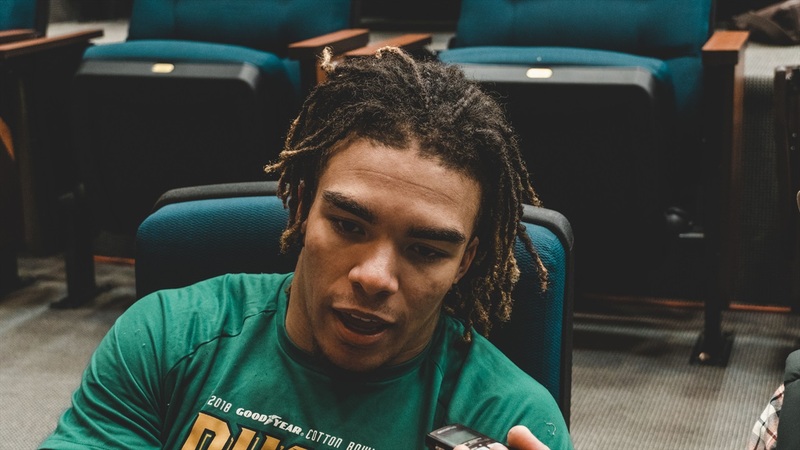 The staff has challenged him to be a 1,000-yard receiver along with moving to the boundary receiver spot, which is a position Claypool has played before this spring. “I played it my freshman year and sophomore year,” Claypool explained. “Even last year, we would motion me into the boundary. It’s not a new idea, but it’s just my spot now. Claypool is raising his game, but other receivers are starting to emerge as well. Kevin Austin Jr., Lawrence Keys III, Braden Lenzy and Michael Young have all started to make big plays, which is music to Claypool’s ears.